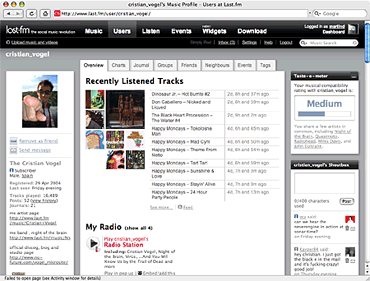 I happened to stumble upon Cristian Vogel’s Last.fm user profile, and found it an excellent example of the many treasures our community has to offer. For the uninformed: Cristian might be most well-known as being one half of Super_Collider, along with singer Jamie Lidell. He has been producing and releasing music for quite a while, and their combined creative output is among the most important cornerstones of the European electronic music cosmos. Not only is he an avid user of the site, he uses his journal to publish stories of his life as a musician, his record label station 55 records, to tease us with intriguing technicalities of his production experiments, and much more. In January Cristian also uploaded an unmastered preview of an upcoming Night of The Brain album, and went as far as allowing full-length previews for a limited time. It’s quite an exciting album, was recently released under the title Wear this world out, see his announcement for details. If the music industry was more like this I’d have less of a bad conscience when I’m spending money on CDs.